Alan is one of the best instructors you can have. I have been learning to drive for three years now and it's been a long journey but ever since having Alan as my instructor I've managed to pass first time. Alan is really good, helpful and patient. He explains everything to you in a nice and concise way and he ensures you understand everything before carrying on. He puts in every effort to make sure you're driving to your best ability and provides you with all the necessary skills you need to pass your test. Anyone out there who has tried different instructors and it's not working out Alan is the one for you. He's also very punctual and every lesson you have is a step closer to you passing your test. You won't regret it. I'm really grateful to Alan and I know he'll do the same for you and he's done for me. 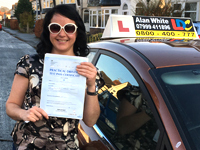 I'd been having intermittent driving lessons over the past few years, and I started learning to drive with Alan after my previous instructor went full time at their other job. I'm glad Alan was able to take me on! He's really boosted my confidence on the road by giving me positive feedback when I was doing well, and clear explanations of how to fix my mistakes when things went wrong. It also helps that found him really easy to talk to, which helped to put me at ease during lessons. I'd happily recommend him to anyone who's considering learning to drive! All thanks to Alan, I passed my driving test! I’ve been learning to drive on and off from the age of 17 however lost the confidence to carry on. Since meeting Alan, my confidence has boosted massive amounts. Every step of the way, Alan was calm and very supportive. He never made me feel nervous or pressured during the process. In each lesson I felt at ease and encouraged, learning from my mistakes along the way. The LDC workbook was also a giant help, something which you don’t get with other instructors! Overall this experience has been a pleasure and I owe a lot to Alan for helping me to achieve this milestone, I didn’t think I could. Absolutely delighted to have passed my driving test, really enjoyed learning with Alan and always felt confident and reassured with every lesson. His teaching style made it very relaxing and easy to learn and I’m very thankful for all his support. Would 100% recommend anyone looking for an instructor to go with Alan, passed within a few months and couldn’t have done it without him. I passed my driving test first time with only one minor fault all thanks to my amazing, brilliant driving instructor Alan! I got my lesson recommendation from my sister, who insisted me that he is the one to go. No doubt he made my lesson a breeze with his patience & guidance from the beginning till the end! I like the fact that he’s always so calm and happy to repeat anything that I wasn’t sure about. He’s so organised and flexible, always making sure I got a lesson once a week and that my classes were well taken care of even though he was away. Coming from a different driving background, he definitely made driving here in the UK easy (with all the complicated road rules and regulations)! He always gives me the most constructive criticism & positive feedback, which helps build my confidence on the road after each lesson to the minute before I went. I’d highly recommend Alan to anybody - great instructor with the most down to earth and collected personality I’ve ever met. Professional, punctual yet fun and friendly! Thank you so much again Alan! 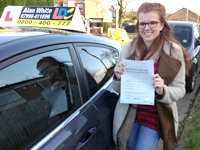 I passed first time due to my great instructor Alan! He is a brilliant instructor with a great personality and has guided me from the beginning to the end when learning to drive. On my first lesson I didn’t have a clue how to drive but he talked through everything step by step! If I was to make a mistake he would talk me through the procedure again. He made me feel really confident about passing my test especially on the day as he kept me calm and told me I could do it! Thank you so much Alan!! I've been learning to drive on and off for seven years with many instructors and was a very nervous driver. Alan was able to build up my confidence in driving. He is very patient, and was always happy to repeat or reiterate anything that I was confused about, and never got annoyed. Whilst Alan loosely based the lessons on the LDC Driving Skills Workbook, the lessons were focused on aspects I found most difficult (manoeuvres!). On a practical level Alan was sure to prepare me well for the test, and was always punctual and professional. I would definitely recommend Alan as a driving instructor! Thanks Alan! 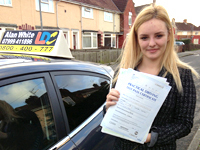 I passed first time thanks to Alan's great help and tuition. On my first lesson I had no idea how to drive and Alan was very patient and thorough in teaching me the basics. From then on, I progressed each week and Alan helped me by telling me when I had done well but also talking my through the mistakes I had made and how to improve. Alan made sure I was fully prepared for my test and this is why I passed my test first time with 1 minor fault. 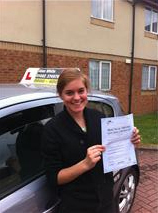 Alan is an amazing driving instructor, who managed to get me to pass my driving test first time with only 2 minor faults. I struggled at first with my driving, but Alan always pushed me until I managed to get it all correct. He is a lovely person, with a lot of patience. I wouldn't have passed, or done any of this without him. 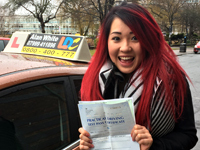 I got my recommendation to take lessons with Alan, from my sister who passed second time with him. Would recommend Alan to anybody, great driving instructor. Thanks again! Can't believe I passed my test 2nd time with only one minor, that's all thanks to Alan! He was amazing with me teaching me even though I know I used to annoy him and sometimes not listen to what he said, he still put up with me and helped me as much as he could! Always going out of his way to pick me up from where ever I was, thankyou so much Alan! 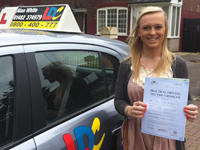 You are a great driving instructor and will recommend to anyone!! 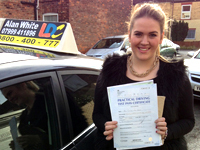 I passed first time today due to my amazing instructor Alan! Alan is an excellent instructor with a sound temperament and calm personality that allows you to feel at ease when learning to drive. His knowledge on the test and safe driving is beyond me and knowing everything he had taught me about the test I was confident about passing (even though I was really nervous). Alan's preparation and structure of each lesson is really positive especially before your test, Alan would often take me on the actual test routes and this would only benefit me in many ways. If I was to make a mistake Alan would not critise me but constructively guide me through my mistakes and help me put them right, without any panic even when I was struggling to reverse park properly before my test!! But luckily I got it spot on, on my test due to Alan's guidance. 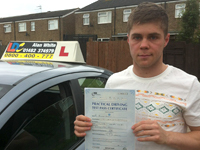 I have already recommended people to Alan as he is definitely one of the top instructors in the area. Thanks a lot Alan!! 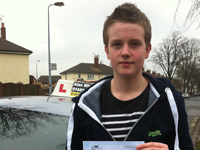 Big thank you to Alan for helping me pass my theory and driving test!! 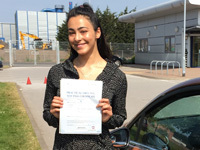 The thought of driving in the UK was completely foreign to me at first but Alan was really thorough with everything and he also made sure that everything I needed to know about the test was covered with nothing left out. He's genuinely very friendly and really flexible with all my lessons. I cant thank Alan enough for all he's done, would definitely recommend him to anyone as he is an amazing and brilliant instructor!!! Thanks again Alan!!! After failing a previous driving test almost a year ago, I got in touch with Alan. He helped me get back to test standard and rebuild confidence in my driving ability within a few months. 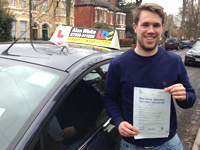 Alan has been a great driving instructor - professional, punctual and friendly. Thanks Alan! Alan is a fab driving instructor with tons of patience. He made learning to drive fun, which sped up the learning process. 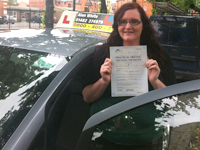 Whilst learning to drive with Alan my confidence on the roads has improved significantly, and to my surprise I passed! If you're looking for someone who will take the time to reassure you that you're a good driver and prepare you thoroughly for your test Alan is the man! I'm sure he will miss me telling him all the dramas of my life. Thanks Alan. 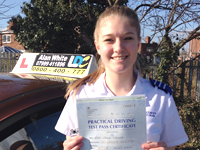 I passed my driving test first time! At first I had no confidence in driving at all, but Alan is so patient and supportive and really helps ease your nerves. Whenever I made a mistake, he was very calm and didn't get frustrated with me which was extremely relieving. He also explains things in ways that are easy to understand and remember. I am so thankful for all of Alan's help and I would recommend him to anyone as he is an amazing instructor! Passed first time! I came to driving a little late in life and Alan was a fantastic instructor! He is thorough and supportive, and took note of what we did each lesson so everything was covered with nothing left out. He is calm and the nerves I had starting the lessons quickly vanished so by the day of the test he was so reassuring and calming that my nerves were all but gone! 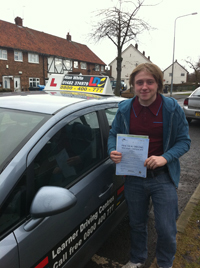 I never thought I would get here but passed first time, I would highly recommend him to anyone; a huge THANK YOU Alan! 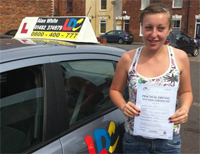 I started driving lessons 6 years ago with a different instructor, but due to lack of confidence, I stopped. After one of Alan's previous students had recommended him to me, I gave it another shot. Alan is a patient instructor who doesn't just give you constructive criticism but praises you on the things you do well, also giving tips on how to make you a better driver. I had my good and bad days but my confidence soon came back. With that, I am extremely pleased that I have passed my theory, and practical test the first time with no minors! Thankyou Alan! 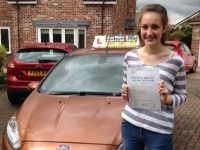 Huge thank you to Alan for helping me pass my driving test with only three minor faults. 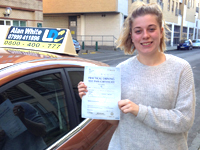 I was an incredibly nervous driver at first but Alan always found a way to help me relax and explained everything in a way that suited my learning style, I would recommend Alan to anyone. 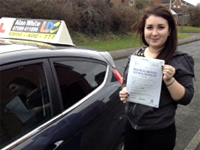 I passed my driving test with only two minor faults thanks to all of Alan's hard work. I couldn't have done it without Alan being so patient, friendly and reassuring. There were plenty of times throughout my time learning that I felt like giving up but Alan always tried to build my confidence aswell as being completely honest about how I was progressing and ensuring I learned from my mistakes. I've already recommended Alan to a number of friends and I'll definitely continue to recommend him. Thank you Alan! 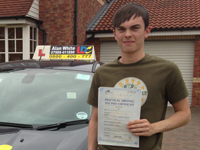 I couldn't have wished for better driving instructor than Alan, I would thoroughly recommend him to anyone. 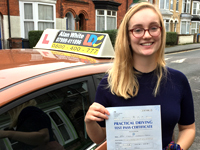 I was really nervous about starting lessons but Alan soon put me at ease and reassured me I would be a competent driver in no time! I passed both my theory and practical test all thanks to Alan and the LDC skills book which helps to consolidate what you've done during your lessons. I can't thank Alan enough for all he's done for me, he had faith in me every step of the way! Choose Alan as your driving instructor and you won't regret it! 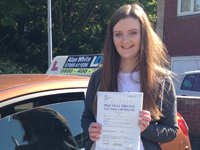 I would just like to say a huge thank you to Alan for helping me pass both my theory and driving test first time. Alan has been a great instructor, offering support and guidance throughout my learning. Every lesson Alan would make me feel calm and reassured, giving constructive feedback and asking what I wanted to practice more to improve my confidence. This made me more prepared for my actual test as I knew what was to come. Although professional, he manages to talk to you like a normal person and not get agitated or stressed when things don't go to plan. Very flexible and understanding at all times. Would highly recommend him to anyone. Many thanks Alan, you have been fab to learn with! I passed today. It was my second shot at my driving test and it went amazing, I honestly couldn't have done it without the help of Alan. He is a professional and an amazing instructor, he is a lovely person and very supportive. Alan was always on time for my lessons and never let me down once, he did an amazing job at helping me pass and I am so grateful for his time and support. Would recommend Alan to anybody. 10/10 such an wonderful and kind person, supporting me the whole time. 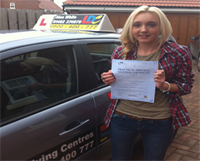 I passed my test first time with the help of Alan, he is really supportive and helpful. He allows you to go at your own pace and makes you feel more confident in yourself. He is a brilliant teacher and anybody who feels they can't do it has no worries with Alan, he is calming and patient with you. I am thankful for his help and would recommend Alan to anyone. I passed my driving test today and I can honestly say its all thanks to Alan! He was so patient with me and encouraging throughout every single lesson. He always had confidence in me and was very supporting if I did something wrong. I really cannot recommend Alan highly enough, thanks for all of your help! 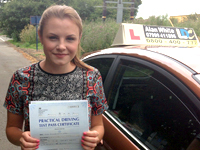 Passed 1st time with 0 faults. 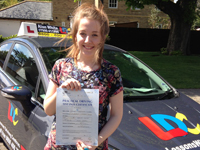 Today I passed my driving test first time thanks to Alan! Such a patient, reassuring instructor, always makes you feel at ease and never rushes you to do anything you're not comfortable with. He makes sure you correct and learn from your mistakes and will give you feedback and encourage you to do better. Everything in the lessons were tracked so you can easily see what's left to do. Highly recommend him and couldn't thank Alan enough! 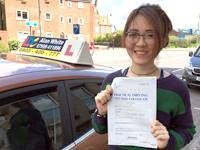 I passed first time thanks to Alan! He is a very patient and laid back teacher which takes out all of the pressure, I had a road accident on my scooter which made me very nervous and apprehensive about driving, Alan was understanding and got me over that. 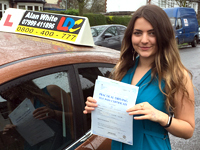 It only took me three months to pass with Alan I would recommend him to anyone, Thank you so much Alan! 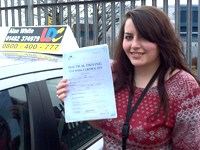 I just passed my driving test, thanks to Alan's patient and careful instruction. At 65, I was Alan's oldest student. I have been driving for almost 50 years on an American driving license, so Alan had to teach me to unlearn a lifetime of bad driving habits and learn good ones. Even after my worst performances, Alan was always constructive and encouraging. He has my highest recommendation. Alan is an absolute legend! I really enjoyed learning to drive with Alan - he's incredibly calm and reassuring and definitely the most patient person I've ever met! He's very flexible with lesson times and always made sure he could fit around my schedule, and he explained everything really clearly during the lessons which was very helpful. I would definitely recommend him to anyone - he's very kind and friendly and teaches in a way that makes you feel really confident driving. Thanks Alan! 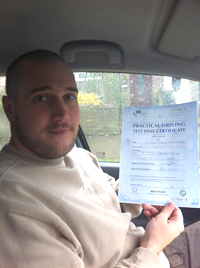 Passed both theory and practical tests first time Thanks to great tuition from Alan. 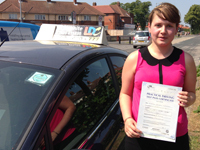 Made me feel very at ease and allows you to go at your own pace, very calm and patient. Progress was tracked so you always know what you've done and what you've got left to do and also what your going to be doing every lesson which was great for me.Would recommend Alan to anyone learning who wants to learn and enjoy it at the same time! Thanks Alan! Couldn't have found a better instructor to learn with, Alan is very patient and professional and fits around your weekly schedule as best as he can! 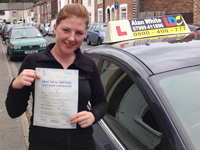 I now feel very confident and comfortable when driving and would highly recommend anyone to do lessons with Alan! Thanks so much! Can't describe how happy I am to be a fully certified driver! And it's because I've been have the best instructor in whole world! One more time I would like to say big thank you to very good, polite, friendly, supportive driving instructor such as Alan is! You gave me confidence and being motivate me and I did that finally! I am sure that Alan is 100% the best teacher! I passed my test first time thanks to Alan. 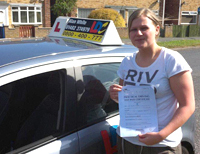 I fully enjoyed my lessons as I didn't feel any pressure, I was fully ready when the test day arrived. Due to Alan's style of teaching he was able to explain things in a way that I understood well. Alan was very flexible and always made sure he could fit me in around my schedule so I always had a lesson each week. I am very thankful to Alan for helping me pass my test! I passed both my theory and practical test first time and got a clean sheet in the exam. I would like to thank Alan for all his patience as I could not have done it without him. His calm and reassuring attitude helps to put you at ease and makes you feel comfortable driving for the first time. 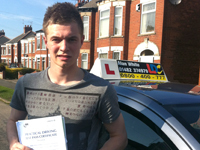 I would highly recommend him to both new drivers and people looking to change instructors. Thanks again Alan. 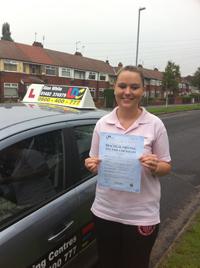 Passed my test first time today with only two minor faults and couldn't have done it without Alan! I am so grateful for what he's done, was so patient and honest about my progress which really helped me develop. It only took me from July to December to pass both my theory and practical first time thanks to the clear structure of each lesson that helped me learn everything quickly but thoroughly. I have already recommended Alan to a couple of friends and would definitely recommend him to more! Felt so relaxed and confident in the lessons and definitely felt ready for my test. Thanks for everything Alan I really appreciate it! 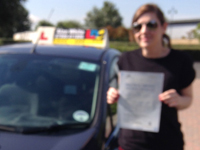 I first started lessons four years ago but never really got anywhere.Then I started lessons with Alan, and after 18 hours of lessons I passed my test first time. Alan was honest with me about my progress and put me at ease behind the wheel. He adapted his teaching technique to best fit how I learn as an individual. 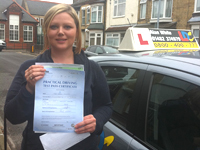 I don't feel that if I had another instructor that I would have passed so quick or be the confident driver I am now. Thanks Alan. Passed my test first time. Could not recommend a better instructor. Makes you feel confident and at ease. All things I read before contacting Alan and they couldn't have been more right. I would highly recommend Alan to anyone starting lessons because he is very patient, clear, positive and makes you feel confident and at ease. 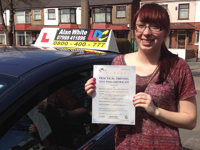 I passed my test first time and to be honest I don't think I would have if it had not been for Alan. You notice progress every week. I started at the end of August 2013 and passed end of January 2014, now to me, that was quicker than I expected, especially as I was only having one lesson a week or sometimes one every two weeks! All in all he is a brilliant teacher, very patient and a very nice guy who is easy to get along with. 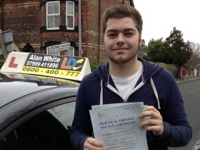 Thankyou Alan, I don't think I would have passed first time without you. 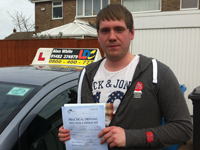 I couldn't believe that i had passed both my theory and practical exam with Alan. His easy going nature, made it really easy to get along with and build confidence in driving itself. Alan couldn't have been more helpful in tailoring lessons to help with any issues and the LDC driving skills book helps too. Thanks Alan for everything! I now even have my own car! Couldn't have done it without you! 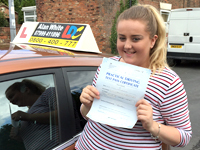 Alan is a fab driving instructor, I would recommend him to anyone. He does his best to always fit your lessons in around your schedule and had the patience of a saint teaching me how to drive! Very professional and makes you feel at ease straight away even if you are nervous :)! Thanks Alan!! I was originally very nervous about starting driving lessons leading to me waiting a few months after my 17th birthday to start. However after my first lesson with Alan I quickly became relaxed and looked forward to lessons, this was largely down to Alan's relaxed nature and although he pushes for great results, never expects too much. 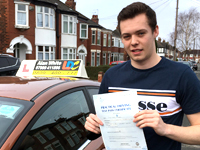 Alan was recommended to me by a friend of the family who had passed his test within 6 months, and as soon as I started my lessons I could see why he had progressed so quickly. 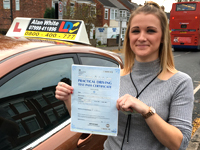 I passed my test first time and can't thank Alan enough for his help!if you want flexibility, very competitive prices and fast progress then lessons with Alan are the way to go! 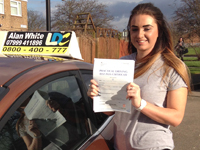 I started driving originally with another instructor, however, he stop doing driving lessons and left me with quite a few gaps in my knowledge of driving. Two of my friends recommended alan and he was more than happy to take me on! Alan is very patient instructor and was very thorough in everything I needed to learn to prepare for my driving test, which I passed first time! I was so happy! Thank you Alan!! I never thought I would pass my test first time but i managed to do it with alan's help! He is an excellent teacher; very patient and understanding. He is flexible with booking lessons and will always try to fit everybody in, the car is also very nice to drive. The LDC workbook really helped as I could look at what I was going to learn before actually doing it in the lesson. I had a few different instructors whilst away at university but none made me feel as comfortable and confident as Alan did. I'll never forget Alan White! I passed first time and I'm now a safe and confident driver. Each lesson was a pleasure and was tailored perfectly to my needs. 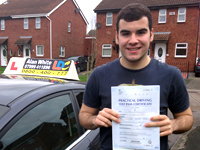 I would recommend Alan above anyone else, if you want to learn to drive safely and efficiently, then Alan's your man. Thanks so much Alan, I couldn't have done it without you haha. 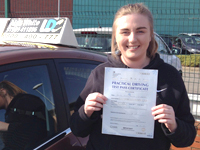 I started my lessons with Alan after a recommendation, I was nervous at first but the nerves soon disappeared, Alan makes it very easy to gain confidence whilst driving. His excellent lesson planning and organisation allowed me to be prepared for my next lesson. 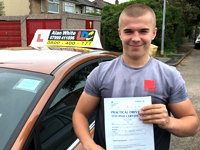 I couldn't believe it when I passed both my theory and practical tests first time and I owe it all to Alan. His patients and positive attitude during my lessons allowed me to be confident and calm during my test, I couldn't recommend Alan highly enough to anyone wanting to learn. Thanks again Alan. Couldn't believe it when my examiner told me I'd passed my test first time! After being so nervous, I flew through my test. All thanks to Alan! 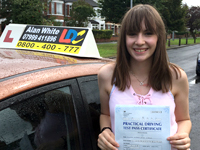 I started my lessons shortly after my 17th birthday after Alan was highly recommended by a friend. After hearing how good he was I didn't even consider using anyone else. Lessons with Alan are so relaxed. Sometimes it felt as if we were just going out for a drive. His calm and positive attitude makes you feel at ease, making it easy to take in all the tuition. 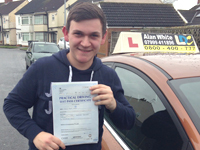 I couldn't recommend Alan highly enough, he'll have you passed in no time! Thanks for everything Al, if you go with White, you'll be alright! 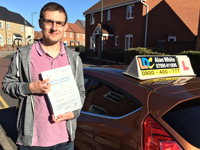 I took lessons with Alan after a recommendation and have just passed my test. He was patient, professional and never late. Alan made everything clear and easy to take in and helped me build my confidence, I would strongly recommend Alan to anyone wanting to learn! 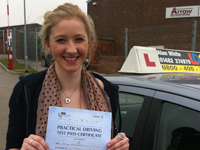 I couldn't believe it when my examiner said that I had passed my test! I wouldn't have been able to do it without Alan. Alan has been my personal tour guide over the months showing me around East Hull showing me places that I'd never seen before. I'm going to miss Alan's diagrams on his mini whiteboard/photo album and our Friday lessons. However I don't think he will miss me cracking my knuckles every time we stopped. 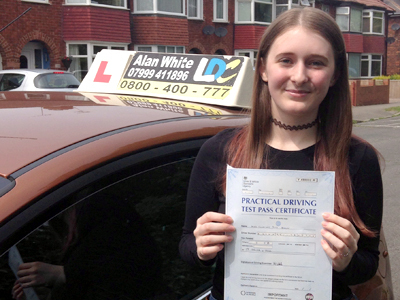 Having recently passed my driving test first time I owe it all to Alan, I started my lessons on my 17th birthday and he had me passed within 6 months I always looked forward to my lessons with Alan and he was always calm, reassuring and easy to get on with. Alan was very supportive and didn't put me in for my test until he was sure I was ready for it. I highly recommend him to anyone learning drive, cheers Alan! I passed my test first time and I couldn't believe it when I heard the words " I'm pleased to say you've passed" I definitely have Alan to thank for this, it was so easy and enjoyable to learn with him and he has given me so much confidence to drive. Alan's strategies of teaching were really understandable for example if I was maybe a bit slow at learning a certain manoeuvre or skill Alan would always go out of his way to explain in great detail with his mini white board so I could visually understand, this made it so much clearer, another thing that I think is really important is that Alan is so friendly and so easy to get along with, I would recommend him to anyone! he wasn't late for a single one of my lessons and just to remind me he would text me the night before every lesson which really helped as I am always quite busy with college work but overall I passed my test and Alan got me through it all, definitely going to miss my Friday morning lessons haha, thank you so much Alan!! 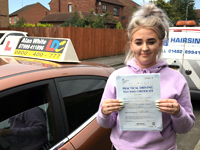 I recently passed my driving test, and would like to thank Alan for that as he has a lot of patience and is so supportive throughout every single lesson, I enjoyed every lesson and I would recommend him to all thanks again Alan. From the moment I got in the car to the moment I passed my test Alan has always been very supportive, friendly and patient. Whenever I had problems with any part of driving he always made sure that I worked on them to become more confident. He gave me all the information I needed to pass my theory test and provided me with LDC DVDs and books, which helped me pass first time. After taking a year break from my driving lessons Alan prepared me for my test in just over a month and I passed first time! 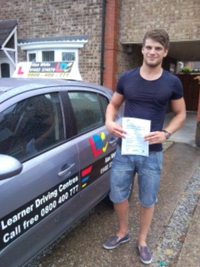 I'm very glad that I managed to get such a good instructor and would definitely recommend him! thanks Alan! Yey I've passed!! Thanks to Alan. I highly recommend lessons with him, patient, friendly, supportive, and makes you feel very confident. Could not ask for a better instructor. Thank you Alan, you have been great, Jay. I'm happy to declare I've passed my driving test learning with Alan recently. Having tried a few times previously via other companies, it was of great relief to find a teacher like Alan. 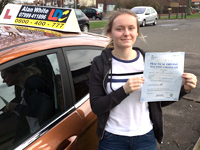 The lesson's were a great rate and an absolute pleasure, and found his teaching methods far superior to even the big accredited company instructors, who could not get me to the standard I achieved quickly with Alan. I can only recommend to the upmost Alan, through honesty and appreciation of helping me succeed faster and more confidently than expected in my driving test. I started to learn to drive when I was 40. Alan was a superb driving instructor. He is extremely professional (never late nor cancelled a lesson) and always texted the day before to remind me. Alan was very patient, easy going and meticulously explained all aspects of driving and performing the required manoeuvres. I opted for a semi-intensive early morning course over a number of weeks and passed my test first time after 24 h of tuition with Alan. I would recommend Alan without any reservation. 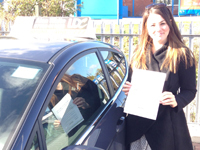 I recently passed my test after starting to learn how to drive at the age of 28. I found Alan patient, helpful and friendly on every lesson. He explained things well and was always approachable to answer questions. 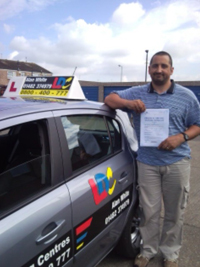 Alan advised on all aspects of driving and really helped with the theory element of the test - he went above and beyond all of my expectations as an instructor, nothing was too much trouble. I passed my theory and practical test first time around after only 6 months - I would definitely recommend Alan for anyone learning to drive. 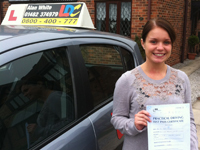 After trying other instructors with no success, Alan gave me the confidence to learn with ease. Alan is a patience and friendly instructor who made me feel comfortable and enjoy learning with him. I would recommend him to all. I passed my test first time after doing lessons with alan, I had previously done lessons with different intructors but never had the time to do my test due to work, alan is a brilliant instructor and made me feel at ease driving and made it more enjoyable rather than been nervous I now drive and feel confident driving. I started driving shortly after turning 18. After phoning up several driving schools and being unsure about starting to drive, a friend recommended Alan. Alan supplied me with the essential DVD'S and books and really helped to boost my confidence. He is patient and friendly and i thoroughly enjoyed learning to drive. I knew i could ring Alan to ask him any questions or queries which a had. I passed both my theory and practical first time with 2 faults which really stunned me after learning for only a few months. So thanks Alan for helping me along the way, and for giving me this experience! I would definitely recommend him. I finally got around to learning to drive at the ripe old age of 28. After phoning a couple of people from LDC with no response, I left a voicemail with Alan and he got back to me the same day. 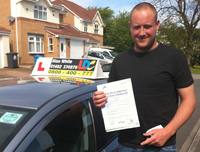 Alan made me feel calm and relaxed from day one, and is a very patient instructor. He helped me to iron out the bad habits I'd picked up from years of riding motorcycles. Alan got me to test standard at a good pace, and I passed my test first go with only 1 minor fault. I would definitely recommend Alan to anyone wanting to learn to drive. Thank you Alan. Alan is the probably the best instructor one could ask for. He's patient, really friendly, with a sense of humour and manages to actually make your driving lessons a genuinely enjoyable experience! He does his best to make sure you are well prepared for your test, but what I also particularly appreciated was that if I had a question, or a problem I knew that I could ring him at any time, knowing that he'd be happy to help. I couldn't recommend him enough! 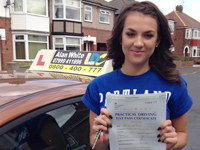 Having recently passed my driving test with no minor faults, I would just like to say a big thank you to Alan. 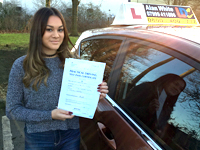 Having no driving experience at all, Alan's style of teaching quickly filled me with confidence, and made my lessons both informative and enjoyable. Combined with the the LDC books and DVD'S, Alan made sure I was well prepared for both my theory and practical tests. I would definitely recommend Alan to anyone who is considering taking driving lessons. Choosing Alan as my driving instructor after being recommended to him by a friend who passed first time was definitely the best decision that I could have made with hopes of passing my driving test. After relatively few lessons Alan ensured that I was fully prepared for my theory by supplying me with all of the essential DVD's and books completely free which enabled me to pass first time. 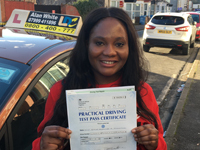 Soon after Alan booked my practical test for me, he was extremely helpful, informative and also very friendly and easy to get along with; this style of teaching was what gave me the confidence and ability to pass my test first time. 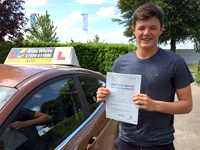 My thanks go to Alan and I would recommend him to anyone who wants to learn to drive confidently and safely. Thanks again Alan! I booked a semi intensive course with Alan and could not of asked for a better instructor. Not only is he friendly and easy to get along with, but he is very professional and from the moment i sat behind the wheel he made me feel very relaxed. 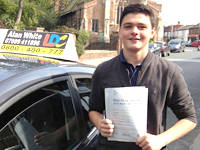 He makes learning easy and the proof shows because i passed first time and with only 2 minors. 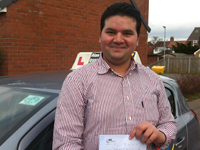 I would definitely recommend him to anyone who was planning to get there licence. thanks Alan. My driving experience with Alan was not only a great way to learn how to drive, but it was also a fun and comfortable experience. His helpful visual aids and reference points make mastering the manoeuvres simple and easy to remember. The aid of the LDC DVD and workbook allow you to make notes on reference points and other things to remember in the appropriate sections. 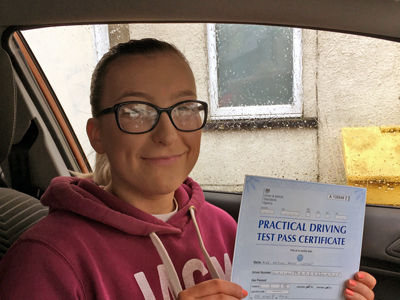 The LDC disc is also a great way to learn and practice the theory test, plus you can also see what the practical test is like so you know what to expect on the day! The cost of lessons is very reasonable and he makes the most of your money by teaching you something different each lesson. I found Alan great fun to learn with and I quickly made great progress with Alan. I could not have asked for a better driving instructor and I would recommend him to anyone learning how to drive. Thank you Alan! 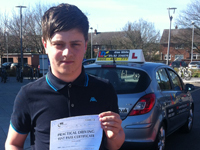 I am a 17 year old student and am pleased to say thanks to Alan I passed my driving test firtst time. 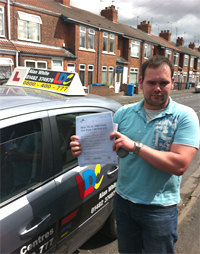 Learning to drive with Alan was a great experience he is very friendly, easy to get along with and very supportive. I always felt I had made good progress following a lesson. Alan was very clear and precise when explaining things. 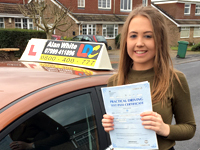 I would recommend Alan, he made me feel confident and ready for my test quickly he is a very good driving instructor and I would highly recommend him to anyone wanting to learn to drive. 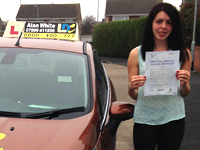 Having driving lessons with Alan was a very successful choice and I would highly recommend lessons with him. From starting them as I turned 17 he taught me how to drive and be ready for my test in a short amount of time. Learning with Alan was a pleasure, he was friendly and always enthusiastic about his job to teach me. His friendly and approachable manner made it easy for me to feel comfortable whilst learning and also his encouragement gave me confidence. He ensured I was prepared for my theory test as well as my practical test which resulted in me passing both tests first time. 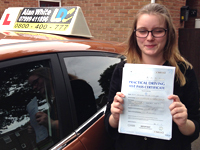 I am now a cautious, safe and confident driver, all thanks to Alan! I finally got around to learning to drive at the tender age of 38 and was lucky enough to find a great instructor in Alan. 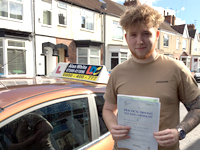 His calm and patient tuition made it easy to get to grips with driving for someone who had never been behind the wheel of a car before. 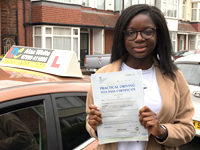 I passed my test with 4 minor faults after around 30 hours of lessons and I am very happy with both gaining my licence and the cost which was very good comparedto other learners I have spoken to. 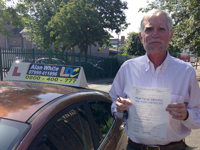 Anyone taking lessons with Alan can be confident in learning how to drive well in a relaxed environment at a reasonable price. Thanks Alan, you have been great. Alan is such a supportive instructor providing me with the essentials to help me pass my theory as well as my driving test; even if you ring him at midnight asking for a cancellation. No matter how you learn, Alan will adapt his teaching techniques to suit the way you understand things. Alan would be the calmest person you will probably meet in your life, making him pretty easy to relate to. Furthermore if you have a busy schedule like me, Alan will do his best to try fit lessons to suit you. Alan is a friendly teacher. Easy-going and helpful. I would recommend him. He helped me build up my confidence and the workbook and DVDs were a good help. 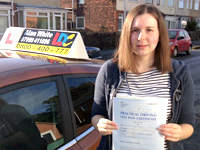 The one-to-one teaching was a big part in me passing my test on my second attempt. Alan was always willing to fit lessons around my busy work commitments. Thank you. James.